Are Edmonton Community Ice Rinks Melting? The Edmonton Federation of Community Leagues conducted an Ice-Skating Amenity Survey for Community Leagues (2018) to learn more about community league ice skating amenities and operations. Fifty-seven Community Leagues across Edmonton participated in the study. Love skating at your local community rink? Ever wondered what it takes to operate and maintain them? What could improve the rink management system in our city? 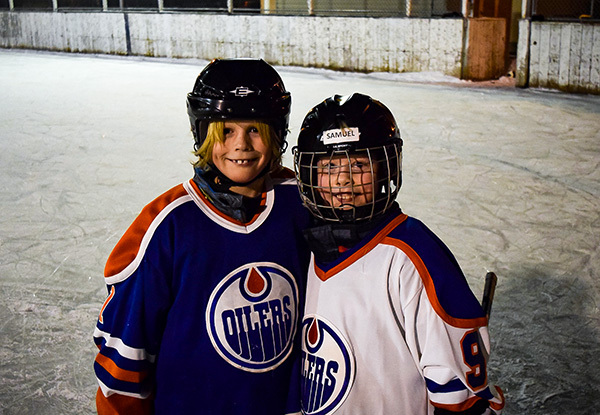 Erin Northey, the Edmonton Federation of Community League’s Active Recreation Officer, talks about what it takes for communities to make their rinks a central “third place” in the heart of their neighbourhood. It’s a sublime experence to be outside on a rink on a winter night. The sounds, the puck hitting the boards, the skate blade in the ice, combined with the evening quiet. Magic. But for how much longer? Ice rink amenities play a central role in Edmonton’s winter programming and align with the Live Active and Winter City strategies. Dedicated community league volunteers work hard to bring affordable recreation, sports and social activities to Edmonton communities. Eighty community leagues said that their ice-skating amenities provide affordable winter recreation for the community, bringing people together to provide a positive, safe, and inclusive community space. 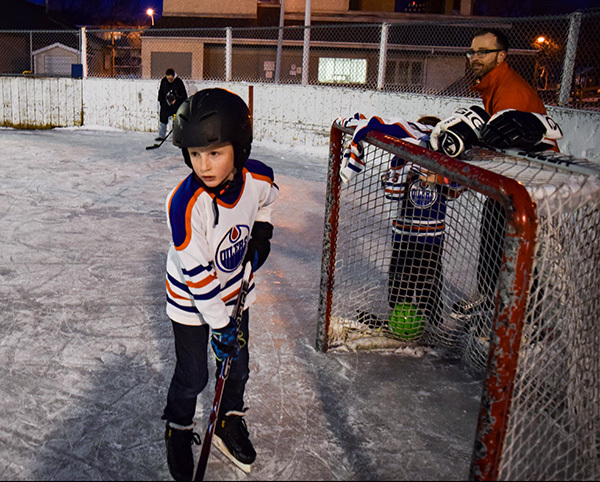 There are 117 outdoor ice amenities operated by community leagues in Edmonton, with thousands of volunteer hours poured into maintaining, managing and supervising the rink, snow removal, flooding, the running of programs and events, as well as many other duties. On average, community leagues are paying between $7000-9000 for operations and staff contractor wages per season. With most leagues only receiving around $17,000 in operating grants, most community leagues are left to wonder if it will be enough to keep community rinks alive for their neighborhoods. Community leagues are feeling the weight of maintaining their facilities and operations. With an average of 485 hours poured into flooding the rink and providing facility operations per season, counting on three volunteers, two paid staff and one contracted staff, communities are worried that without a consistent flow of resources coming in, they will not be able to provide or maintain a community rink. Amongst the survey results, the biggest reasons community leagues cited as to why ice-skating amenities could not open were the lack of volunteers, no monies to hire people to flood and maintain the ice, and ice rink infrastructure needing up-grading and equipment. Indeed, as many as 92 community leagues indicated that person-power was a significant challenge for them to operate and maintain the rinks. For a community, skating on an outdoor ice rink is a different experience than skating at an indoor rink; it tends to be more of a social, less competitive, and more relaxing environment. The outdoor skating rink provides a “third place” for Edmontonians. Life without community has produced, for many, a lifestyle consisting mainly of a home-to-work-and-back-again shuffle. Social well-being and psychological health depend upon community and the “third places.” Whether in an urban city center or suburban neighborhood, an ice rink is a “third place” where like-minded people can socialize and connect. Given the choice to ice skate indoors or outdoors, many people will choose to skate outdoors. In many cases, skating outside reminds adults of when they were kids, skating on the local ponds — perhaps playing pickup hockey or meeting someone for a date. Fond memories are strong at ice rinks. If we want our children and the next generation to be active and continue tradition, we need to show them outdoor rinks are important and commit to consistent resources for community ice rink amenities to ensure community rinks live on for generations to come. The weather is cold in Edmonton from November through March. Taking advantage of those frigid temperatures while also having fun in the process makes perfect sense. Edmonton communities need a long -term solution for the preservation of outdoor amenities. Indeed, it isn’t sustainable to wait for a short-term crisis where a sponsor steps in to save the day – year after year. 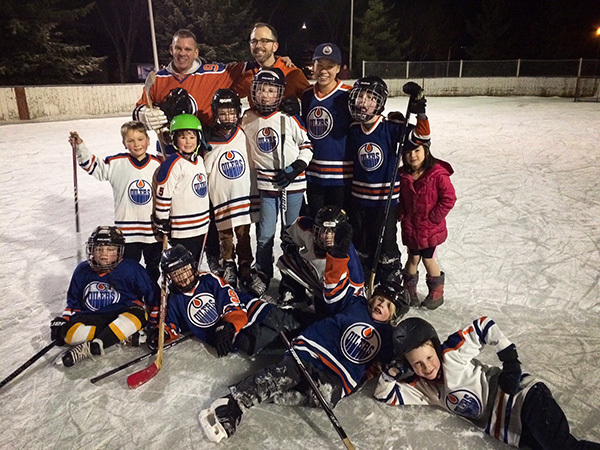 Outdoor ice rink activities are part of the Edmonton fabric, they are part of our grassroots community. We must continue to partner, protect and preserve the ice rink culture as a way of life for Edmonton communities.